So not only are we negative now we are "absolute f***wits" according to one member of Sale Sharks staff. Poorly worded, but she's got a point. Do people never learn about Facebook and the perils it entails! So many people have fallen foul of posting things on social media sites over the past few years, you would imagine that everyone would be a bit more savvy about what they say in public. Holleh eh? I wonder what the diminutive for that is? I don't use social media, never have done, never will. & one of the main reasons is that it is so easy as a layman for your thoughts/opinions to be misinderstood. For a professional person and paid emplyee to have posted what she did about her employers customers !??!?!?!?!??!?!! Perhaps she's also insulted other fans customers on this forum. Customers who pay her wages. haha who is the f**kwit. a)the one who comments about the clubs relentless social media policy despite the club can't get its house in order at the business end (eg on the pitch). 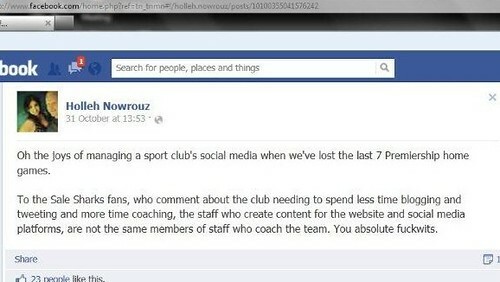 b)the media savvy sale sharks employee who, besides running the clubs social media offering, decides on social media site on their profile I am presuming to public settings (in order to attract more 'friends' no doubt), refers to the clubs customers/ consumers (commonly known by the fans as the fans) as "absolute f**wits". Hmmmmm......P45 for Holleh/Holly. Obviously she shouldn't be let near a social media site. I'm guessing no one has told her about BK's "supporter is king" speech. Olyy - Ratner had a point, it didn't stop his customers deserting in droves and his business collapsing. Well thats just about typical from this franchise. Utter shambles, kick anybody out who cares about Sale / the fans, replace them with utter F***wits, who have no idea...brilliant. No, Holleh, the PR department aren't the coaches and aren't responsible for what goes on on the field - but they are responsible for the unbelievable spinning that is designed to detract from our abysmal performance this term. When PR departments revert to being truthful, then we'll start believing what is said rather than automatically thinking the opposite. PR these days is frequently the equivalent of crying wolf too often with the inevitable consequence? One of the first rules of Business Continuity and Disaster Recovery Planning is don't lie and, as far as possible without harming yourselves further, tell the truth - I again cite Perrier and Tylenol as two classic textbook examples. - Working with a new website provider, to build and design a brand new website for the club. whats amusing is its usually the not so savvy players who get caned for saying something on a personal profile which they shouldn't. The person who's job it is to run this should probably release that by slagging off the clubs fans she might be in a bit of trouble?? the brightside is dimes can probably do her job better than her, therefore we all know what dimes solution in that instance is don't we?? although we may bring in a consultant for a few months as well. F**kwits esp if you consider JE's redundancy and the fact he was universally liked and respected by the clubs fans. Edited 1 time(s). Last edit at 21/12/2012 11:32 by stevene. as a starting point for any job, it helps to enjoy your work and the people you serve. Once again a club employee fals at the first hurdle. And the fact that this media team seems so out of touch with the honesty and abhorrence of spin that the fanbase clearly wants, renders their work of little value. That is disgraceful bahaviour from an employee and supposed media professional. I fail to see what Sale Sharks have done to merit the support of anyone lately. Are there any values and ideals behind Sale Sharks? or ar they just poor ones? The club is dreadful on the pitch and in disarray off it. Turning over staff with abandon, formulating long term strategy on the hoof, management criticising players in public, staff insulting fans, players seemingly not putting 100% in. A brand with no history and no visible future. A stadium you cant get to, compounded by being inescapable after watching your team take another beating. Not an attractive proposition. There is nothing more than sepia tinted memories of SALE gone by keeping people engaged with what the current sharks team is doing. More calls to arms seem to me a futile attempt to bring a body of thousands of people closer to a club that is drifting ever further away from them. Why not, as the first step, take the club to the fans? listen, dont talk? Who's for getting some T-shirts with 'I'm a f***wit' printed on the front for the Wuss game? 2000 people belting it out from the South Stand may be one way of getting some attention. sounds a bit football to me. also, 2000 seems a bit optimistic if we lose on Sunday. Nice one people. It's not the best and the perpetrator will no doubt get a well deserved carpeting. However I think the opining that this young person deserves to and should get dismissed is a bit much especially in this economic climate. Everybody f***s up some of the time. FWIW - I don't know the person involved and don't really have a great deal of time for what comes out of SS, I just find some of the comments above a bit unpleasant. Bunkum -- she's a professionla person, getting paid to do professional job. If she faces harsh disciplinary action due to her own behaviour, she has noone to blame but herself. She might as well have written her own resignation letter. How was this person's Facebook page even found? She only said that those that complained about the blogging and tweeting diverting energy away from coaching were f**kwits. Those that want rid of her basically are f**kwits for complaining about use of social media to promote the club and for disliking someone speaking with honesty. Honest maybe, but rude and unnecessary. if you look at when this was actually done (end of October) our esteemed CEO Mr Diamond was wearing many hats including temp DoR alongside his CEO hat. I also remember a number of comments on twitter/ facebook along the lines of "stop doing so much direct marketing and social media because we need to deliver on the pitch". Social media in business is used, at its best, to support delivery and awareness of the product or service. If the product or service is faulty/ not fit for purposse (like Sale at the moment) then you don't need to advertise the fact or try and big it up/ sell some more by a constant stream of social media rubbish. the fact she seems to have completely missed the point sums things up quite nicely. the fact she took to her personal social media profile to air her views on her employers customers just sums up the 'them and us' ethos which comes from SSC concerning all things 'the sharks'. TVS, got some issues with the point you and Olyy are making. 1) Holleh should expect Sale fans to treat the marketing team's output as the representing the club. Otherwise what's the point? 2) If that output is bouncy and fun and all about doing various things "like a shark" it gives the wrong impression when we are losing all the time. Whether that impression is correct doesn't really matter. We are not exactly worth emulating ATM, and the banter-ish vids to some give an impression of frivolity. Not saying it she be sackcloth and ashse 24/7, but it can look a bit like fiddling while Rome burns. And Rome is ablaze right now. 3) As a professional working in social media, her Facebook post is unbelievably crass. Everyone can make mistakes, we all do, but she of all people should be on top of issues like this. does that make dimes emperor nero? quite fitting actually. nero also had a tendency to be rather quick on the trigger finger didnt he? Did he also murder his mother and marry his sister or was that another roman loon? maybe he could try a bit of soothsaying and human sacrifice (oh wait, he already did that), to try to appease the angry gods. Holleh Nowrouz deeply regrets the posting she made on her personal facebook page at the end of October. Disciplinary action has been taken and the matter has been dealt with internally and both Sale Sharks and Holleh Nowrouz would like to apologise to supporters of Sale Sharks for causing unnecessary distress. Dave I'm sure the apology is appreciated by all Sale fans. I sincerely hopes she understands why most fans are, putting it mildly, a bit miffed. Time to move on. No more comments from me. Also nice to see the club (I presume you) are monitoring the board (as always). I find it really weird that anyone would go onto someone else's Facebook account to look for this!! What she put is embarrassing, but it's pitiful that someone would go onto someone's Facebook account over Christmas and post this trying to get her sacked from the club you support! Don't get me wrong, if she'd said that about me and my club I'd be frustrated, but she appears to be saying it about those who are saying marketeers and the social media team should be coaching! What she put is rude, but shaming someone like this is pretty low! Imagine she's feeling now, and her family! Just my opinions, but I'd question more those who accessed and shared this, rather than someone who made a frustrated, embarrassing and misguided comment. So, some distress was necessary. What dreadful wording. Something along the lines of "...for all distress caused," might have sounded more genuine. She makes a fair enough point and I would expect the clubs social media out put to try and remain as upbeat as possible in times of adversity indeed I would argue that is its role. However her final words were ill thought even for your personal FB page. Eitherway it appears to have been dealt with so lets move on. I've just heard from a very unreliable source that she also called us PLEBS!!!! As far as I am concerned, apology accepted. It can't be much fun working for SS in any capacity at the moment and her role must expose her more than most to the fans' frustrations. My only problem with her post will make me sound very 21st century but it's the 23 likes she has on it. That's me over analysing it but for 23 people to basically agree with it suggests she perhaps has players on her friends list, other members of staff or quite possibly this is a common feeling. However I am also completely against how the media in our country acts at the moment. We just pounce on any human faults and due to everything being so easy to access, we can bring it up time and time again and never let it rest. This seems to be what's happened here. I don't like being called a f*ck wit but then who hasn't had a bad day at work? I've been complaining to the council about a neighbour of mine for 3 years. If people saw some of the things I said in texts or messages about the council, the Police, my neighbour, I'd have been locked up a long time ago with the way things are going. She said this in late October, she's been dealt with by the club. She probably regrets it now. Let's not hate her for something we've potentially all done ourselves. It shows you what a bad position we're in as a club when we have a relegation scrap and we're taking time out to make this the most commented on thread of the day. As somebody who's been in and out of work through no fault of my own, I certainly can't find it in me to wish somebody was sacked at this time of the year. Let's move on. Edited 1 time(s). Last edit at 21/12/2012 16:11 by J Moon. If thats the case, they might as well shut up shop now. The club wouldn't be anything without its fanscustomers. Remember that saying companies always used " The Customer is aLWAYS right "
Oh the joys of supporting sports club that have lost 7 Premiership home games in a row. To the members of Sale Sharks social media management team who comment publicly about the mental capacity of the fans / paying customers, maybe you should spend more time thinking carefully about broadcasting your opinions before making them available to the general public because they may upset or offend those same fans / paying customers who contribute significantly to the well-being of the sports club you work for. Ah, the joys of @rsebook and Tw@tter!!!!! Here's to a good game on Sunday. Looks as if the Daily Mail has just gone through this thread & published it online? They appear not to have bothered speaking to the club, just lazy journalism IMHO. Oh dear. I doubt the actual day to day joy, and enjoyment to be had using Facebook and Twitter would make the headlines. Use your brain, only a negative pr controversial incident gets reported, every few months or so. Edited 1 time(s). Last edit at 21/12/2012 17:28 by ballsout. ... Remember that saying companies always used " The Customer is aLWAYS right "
In 1992 I attended a briefing by a senior executive of my former employer. He outlined the bright new vision for our company, and asked if anyone knew who first coined that phrase. I think I may habe been removed from his Christmas Card list when I replied that it was Harry George Selfridge, who went on to reduce his company to near ruin, was turfed out by his investors, and died in poverty. In our case, just follow any one of the threads which follows a team announcement (especially recently!). Those customers can't all be right! Incidentally, I worked for RBS - 'nuff said! Trying to put of bit of balance to this discussion, it appears to me to be a young ( i don't know her) girl who in a moment of pique posted this on a site she thought would only be seen by friends. I really don't mind being called a f...wit as I have been called that on numerous ocassions (not all the time though). consistently failed to obtain any degree of 'clue'. I'm also wary of people who come on these boards for the first time on a certain subject.. you know who are on this one! I always appreciate Swanny's input as he knows, but why the need to put in the message 'end of October'? as if that has some significance. I'm sure Holly regrets what she posted and reads these boards. I would have more respect if she had the balls to come on here and apologise herself... Won't happen though..
Perhaps Holleh(Holly?) should apologise to the supporters on the pitch at half time! Then again she may not be sorry in which case I respect her views but she should go! Well St Swanton and his media apostles have certainly generated an enormous amount of PR via this. Record scores, Cipriani's attitude, Coaches coming and going and going again, staff abusing the fans...every media outlet a Sharks bonanza. I'm looking forward to reading Rugger Ho's post on this topic. ... I would have more respect if she had the balls to come on here and apologise herself... Won't happen though.. I'd guess that would be strictly forbidden by Swanny ES,and quite right too! Although I'm sure the vast majority on here will accept the apology, I'm also sure that an appearance by the young lady would precipitate a barrage of abuse from some posters we've never heard from before, and who probably have little to do with Sale. There seems to be a mentality in "online world" that can't resist kicking someone while they're down. OK some are just pompous and self-righteous, but there's a number who take a perverse satisfaction from just being as cruel as they can manage. Let's not give them a platform. Edited 1 time(s). Last edit at 21/12/2012 19:19 by ageinghoody. No need to say anything to that! IBozz says it at the end of every post. The young lady in question obviously should have known better and has certainly learnt a very hard lesson in public. I have no wish she should lose her job, I'm certain it won't happen again and we've all deserved a second chance every now and again. More surprising than the language, to me, was the fact that she presumably thought we (the fans) couldn't tell the difference between media staff and coaching staff - pretty patronising. I hope this view isn't shared by other Sale Sharks staff, whatever their positions in the organisation. If it is, then Sale have certainly lost contact with their support base and I for one would return to Heywood Road or Davenport before paying one more penny at the SCS. The press have got hold of it now. Torygraph and Wail already. Possibly someone with press connections made contact. The newspaper reports are writing the articles as in the f-wits comment is in reaction to the Toulon game. Odd as I though the FB quote was from October. As others have said, it's poorly worded, but we've all said things we regret in the heat of the moment. It is unfair that morons say "We should focus on playing rugby, not tweeting", as the poor performance of the team on the pitch is nothing to do with them. The two are completely separate and should be treated as such. 45 jumper, Strines has mentioned that, seems you fall into the patronising camp with your thoughts. You are behaving like baying wolves. Move on. One person's exasperation, albeit expressed extremely, does not deserve such indignation. Unless you have expressed opinions on Facebook the outburst was not directed at you. This thread brings to mind the women who would sit around knitting whilst waiting for the beheadings to start. I thought we were better than that, but obviously not. A camp you fall into Toothless by commenting on here ! Do you live in the real world? how do you work that one out? Edited 2 time(s). Last edit at 21/12/2012 21:34 by emerging shark.
" All publicity is good publicity ". Actually I think she was right in her post. I am a f****** as a fan. I mean I've paid over £250 this year to go to a stadium where I can't get into or out of the carpark. I'm then irate before I get into the ground, but I've usually calmed down after the wait to get in the turnstiles. When I get in the ground I wait ages to get served and pay a ridiculous amount for a pint of beer. I then have to endure 80 minutes of generally dire Rugby. Get a grip Sharkbite, were british. Yes I know Woodleyshark2 I should just keep calm and carry on. 'Sale Media Buffoon' I'm guessing this is not the sort of column inches we were aiming for. I am rather bemused at the various calls to leave her alone and it was a mistake/she is a young girl etc etc. She is HEAD of our social media team, like all mangers, it's her behaviour that sets the tone for her team. I would have her out of the door in a hertbeat for gross misconduct. Set an example within the company that the fans are the clients and without us everything is just smoke and mirrors. Amazed Neil Leigh from M.E.N hasn't written a article on this. Seems as soon as Steve Diamond breaks wind its in the MEN. Just wondered how the wind was adhered to the MEN ...superglue ? As if that would matter to <spits> respectable publications like them. OK, in all seriousness - this was bang out of order. The point she made about the media being different to the coaches was completely valid. As iBozz said though, the spin does come from them - from orders above, which, I'm guessing is the CEO? i.e. Dimes? The f*ckwit comment? Like I say, bang out of order. At the end of the day, to reduce it to business terms, as fans, we are essentially customers of the brand. And in any other business, a PR employee having a rant about their customers in the public sphere fully warrents disciplinary action for shaming the name of the company - which she's apparantly had. In other words - we called for disciplinary, it merited disciplinary (Ironically, I'd call HER the biggest f*ckwit for pulling such a stunt which had 'Please punish me' written all over it), she's received disciplinary according to Swanny - she got what was expected, so surely that's the end of the matter? I am a long time reader, first time poster on this messageboard. I am a 20 year student from Sale. My love affair with Sale started just before Dave Baldwins testemonial when I was a young kipper when my old man and his pals from the pub use to take me. I have stopped watching Sale over recent years due to being in Sheffield but also because at a game at Edgeley Park I was asked to move by a steward due to my chanting for the team. I have never made a racial, homophobic or abusive chant or shout in my life and was moved for as the steward said 'being too loud' My old man still watches Sale week in week out and keeps me up to date including today when he told me this issue. It seems the club is in disarray hearing my old man speak about potentially not renewing his season ticket after 14 years hit home hard. I know there are people that have been watching Sale for longer and have spent tens of thousands of pounds on them just to be called a f***wit that will follow them on still and to them I applaud you. I am back for the crimbo hols and despite being first time poster I'm sure if most of you saw me you would recognise me from the Jim Birtles stand at heywood road and the stand opposite the tunnel at edgeley, I use to make up chants such as 'sale army' etc and enjoyed so much being part of the community at the club and am really excited to watch Sale again. Now onto why I am here posting.This woman should not have done what she did, her comeuppance will be that she will struggle to ever get a job in her respective field again, shes not apologised Swanny has done it for her to be honest I dont give two hoots about her either. I worked abroad as a PR for a number of months and would not dream about speaking about the customer in a negative way to anybody. Here is what I was thinking, I will be attending the Worcester game on Friday and would potentially do song sheets in the south stand if people were willing to join in. A few ideas are 'stand up if you're a sale f***wit' 'f***wit till i die im a f***wit till i die i know i am im sure i am etc' I do not enjoy swearing and thus is why I have put it up for serious debate on here before I do anything. If anyone would seriously like to discuss it then please get me on my email address. This attention brought would surely get the likes of Kennedy and Dimes thinking realistically about what they are doing with the club. They have made John Everton and Angie two Sale fans may I add redundant yet someone who has no feelings will never go beyond the call of duty for sale is still in a job after calling us f***wits, no doesn't make sense that one. I am not trying to get the woman sacked by my plans I just want the club to have the right outlook, and I'm sure it would create an OUTSTANDING atmosphere. If things do not change feel free to join myself and my old man to watch our local team Sale FC play at Heywood RD. Edited 1 time(s). Last edit at 22/12/2012 02:47 by IanMason. Point or no point, it is yet another thing that Sale Sharks (whoever and/or whatever that is) seem unable to run properly. How many nails does a coffin need? Please don't persue your idea for another second. One of the reasons that my son and I enjoy going to the games is because of the friendly, amicable and bad language free atmosphere that exist in the South Stand. What you are suggesting would take those three things away. The matter has been dealt with, move on -- you're a young bloke with your PR career ahead of you, think carefully before proposing actions that may come back later to bite you on the backside. Thanks for that Flumpty - the odd swear word slipping out in the heat of things is one thing, but actively encouraging banners with the that word on (even partially disguised with exclamation marks etc) is not good no matter how angry we feel. We are better than that and we should not go down to their level. Or at least not in public! Perhaps the best way to utilise this unfortunate faux pas would be to start a campaign, directed at Kennedy, to have Ms. Nowrouz appointed as Head Coach, on the grounds that she couldn't make a worse job of it than the current shower. Sarcastic yes, but something needs to be done to get the message through that Diamond is killing your club. Again more negative publicity for the club. What on earth was that Sale employee thinking? To be honest she wanted attention and she got it for the wrong reasons. Well done. Alongside the Mitchell thing, this is also reported in the Telegraph. 'Perhaps the best way to utilise this unfortunate faux pas would be to start a campaign, directed at Kennedy, to have Ms. Nowrouz appointed as Head Coach, on the grounds that she couldn't make a worse job of it than the current shower. Rugbybiker, I find the above strange.. as you seem to be making suggestions for us yet it's not your club? Should you not have said 'killing OUR club'? Edited 1 time(s). Last edit at 22/12/2012 13:02 by emerging shark. As others have said, think with any reaction to this it needs to be carefully thought out. Most people's grievances are with the club, as the latest in a long line of 'insults' or errors, rather than with the individual. Yes what Holleh put was rather naive at best, insulting at worst, but who hasn't reacted in exasperation at some stage, she just made the mistake (which really given her position she should have known better) of doing it in writing which could come back to bite her. I'm sure countless others have fallen victim to something similar, whether it be a scribbled note, wrongly sent email etc. She's been punished for what she did, which I'm sure she now regrets, but I do worry that dragging her further through the mud is disproportionate to the offence. Imagine how she feels this morning having seen it posted online, seen fans reaction, been punished and then woken up to her name and misdemeanour in print in the Telegraph, and maybe others. I bet not great. So yes by all means lets show the management how annoyed we are at the current situation Sale Sharks find themselves in, but let's not continue to target one individual. Christmas spirit and all that? Plus, for what it's worth, I personally think the club's social media activity has been pretty good, so let's not damage that good work. I'm still waiting for Rugger Ho' to comment on this. Has there been a reaction? There was a statement expressing some regret, apologising for distress. I do expect a bigger "reaction". Who's the John Mitchell character who can fly in and resolve the off field media and supporter side? Rescuing this part of the organisation may well be even more critical than the on field stuff. I'd like the management of this organisation to take a broader look at the culture it is attempting to develop. In particular its relationship with its fans, or customers perhaps, and its media profile. Events on the pitch are not entirely in the clubs control, how it behaves off it, especially in tough times is. Honesty, reliability and a clear set of values can be maintained, if not bettered during times like these. Several of our rugby peers have responded to troubling times well and have gone on to flourish, often sweeping away old school ideas and achieving a sense of rehabilitation and place. That's my challenge to them, are they happy with media perception, the state of the brand, the feelings of the supporters? You can't guarantee a winning team, but focus on what you can control. Edited 1 time(s). Last edit at 22/12/2012 15:27 by Fu€kwit GIK. We are perceived as a Joke club by a lot of other club supporters, most of which can be laid at Diamonds door, this will only help broaden that view. Numpties on the pitch, numpties off the pitch, supported by fukkwits. That's brilliant! Bless her. What a b£llend! Nathan Barley was a prophecy. The idiots have won. Swanny has put a statement out via the Telegraph, but shouldn’t the person themselves put a written apology out on the official website? But the question needs to be asked, why are they still being employed by the club. Also, a point of note, John Everton was made redundant and this person is still in employment…..
Hale is that the same statement he made on this thread earlier? Sorry Emerging, I don't follow? Sorry to clarify, I haven't seen the statement in the Telegraph, and I assume it's to do with this thread? Is that what is in the Telegraph? or are we getting confused with the John Mitchell business? Yes, there is a seperate article in the Torygragh where Swanny is quoted. The Mitchell story of him apparently leaving in Feb.is another article. Both Mitchell and fekk-gate and on the same page but different articles in The Daily Telegraph. Following a formal complaint from SSSC to Brian Kennedy and Steve Diamond we have received a reply. Time to drop this, I feel. A silly mistake (and haven't we all made them from time to time? ), action taken and now time to move on. Let's not dwell any further on something said in error and no doubt regretted. Having worked in PR, my first reaction to this story was that this is a case of instant dismissal. This is not, as some have put it, a case of a young girl making a silly mistake. This is a case of a professional manager having committed what in her profession a deadly sin. But, having said that, standards have slipped and, in the young lady's defence, she is by no means the first member of Sale Sharks management to talks of good Sale supporters in exactly the tone she has adopted (albeit not using that particular word). So it's very likely she will have been influenced by the atmosphere around her. Given that scenario then I guess a reprimand is about right. What is disturbing is that it now appears that Ms Nowrouz is editor of the official website which should be a serious and professional means of communication between the club and the outside world headed up by a serious communications professional. The fact that John Everton has gone and that Ms Nowrouz, a spin merchant, has been put in charge is a serious error or senior management and demonstrates clearly just what the senior management think of their public. No, I'm not a Sale supporter, I just find it sad to see what's happening to a club I have always had a lot of time for. I feel that the message needs to be got to Kennedy that everything Diamond touches turns instantly to ashes - but I dare say you folks are trying very hard to get that message through. This is not, as some have put it, a case of a young girl making a silly mistake. This is a case of a professional manager having committed what in her profession a deadly sin. All professionals make mistakes and errors of judgement, mako, but there has been internal action and an apology and I think we should all move on. Being a professional includes learning from those mistakes. She no doubt regrets her error of judgement and will no doubt have learned a lesson which she will remember for the rest of her career. If it's any comfort to her, even I made professional mistakes (I know, unbelievable, heh!) - and learned lessons which I never forgot. The difference is that I wasn't hounded by a baying crowd of blood-sport lovers or the press and the matter was dealt with firmly and internally. And, for what it's worth, I do not think it warranted an official complaint from the SSSC. I'm probably pretty high up on the Club's (and this DG's) list of f*ckwits but I wasn't particularly offended by it. Irritated at first, yes, but offended? My skin isn't that thin, thank goodness. It's a free country and we are all entitled to our own opinions - we should just be careful when and where we express them. My comment above, at 21 December, 2012 11:25, was against the relentless spin, smoke and mirrors coming out of CS/SS (and most other organisations these days, sadly) and not against Holleh's FaecesBook post - she is almost certainly following management direction and not running wild. I know it is unfashionable these days, but old f*rts like me believe that PR should be about facts and information, not spin, misinformation or deception. I've said it before and I'll no doubt say it again - PR should not lie but tell the truth unless to do so would cause harm. I'd happily buy Holleh a drink at SCS next time I'm there. 1) I may not agree with what you say, but I shall defend unto my death your right to say it. 2) No matter what you say, or how you say it, somone somewhere will deliberately go out of their way to be offended. 3) I may not agree with what you say, but I shall defend unto my death your right to be told how wrong you are. Edited 1 time(s). Last edit at 23/12/2012 10:25 by iBozz. The difference is that I wasn't hounded by a baying crowd of blood-sport lovers or the press and the matter was dealt with firmly and internally. The difference is, though, that "social media" is her line of work. Those who live by the sword, die by the sword. Life isn't fair at times. John Everton, who everyone says was a good guy, has gone. Someone who make an error now seems to be running things. Is there a message there? On a personal level, I feel sorry for her. A throw-away line a couple of months ago has probably resulted a lousy Christmas for her. John Everton's might be worse though. Edited 1 time(s). Last edit at 23/12/2012 10:30 by DaveAitch. Social media is her line of work, consultancy was mine - but I wasn't hounded when I made mistakes. the matters were dealt with internally, I learnt and we move don. Serial offending is something different, this appears to have been a one off. Let's leave the poor girl alone, she's had enough aggro over this already. So Don is the new scapegoat? To be honest, I don't really care what happens to holleh, that's up to SS/CS whoever. I just see this as another example of why Franchise Sharks is about as far removed from the values and culture of a rugby club that I hold dear. I spend hours every week promoting the rugby fraternity in the north west of England, especially in terms of youth and kids rugby. If this version of Sale Sharks is the pinnacle of our collective aspirations, I'd rather they move elsewhere. I really am fed up with saying this is all over lets move on etc. She should no longer be working for Sale Sharks. Her feet should not have touched the ground. She knew exactly what she was doing she is meant to be a MEDIA PROFESSIONAL. Don is the Bunbury of the Foot-in-Mouth world. So, carry on kicking when someone's down? What's done is done, nothing we do or say will change anything and the point has been made. I just hope that you have never ever made, or ever will make, a mistake in your career. Edited 1 time(s). Last edit at 23/12/2012 12:03 by iBozz.